After last year’s FloydFest I didn’t make it a priority to return this year, and I’m not sure why. Maybe because it’s so close to home and I had such grand plans of making it to Electric Forest and other faraway festivals. Maybe because this year’s lineup didn’t seem to jive with my usual festival fare. Maybe because I thought that by the time it came around my pockets would be empty or I would be saving for something else. 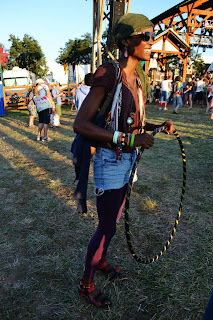 Or — maybe I just fell and damaged my memory at some point after FloydFest X and forgot what a great time I had. Either way, FloydFest XI, with its theme of Lover’s Rock, reminded just how much I loved being there, and just how much I love Floyd, Va. Even better, I got to share that love, having the ultimate joy of taking my boyfriend to his first ever festival. We arrived Thursday afternoon, after a most beautiful drive, to the hustle and bustle that is Floydfest. We parked, loaded up our stuff onto the trailer at the back of one of the Boy Scout busses that offers safe passage to excited travelers, got on board and began our journey down the Blue Ridge Parkway into the main festival grounds. I’d sent our tent in the day before with a friend who was vending to ensure a good spot in the shade, so, after getting wristbands and a festival guidebook, we set out to find it. We quickly gave up that mission and went to find her instead. Once we’d located the tent, we got settled and ready for a weekend of music and memories, complete with free ice cream from Masterpiece Ice Cream Company. I was blessed to receive two free tickets the week before the festival (Festival tickets make a great gift, in case you were wondering. ), which made the experience that much more precious. Knowing that I almost hadn’t made it left me with a feeling of deep gratitude for every memorable moment. Thursday night started things off right: ArtOfficial warmed the crowd up for a stunning performance by Galactic that had me leaping and laughing like a dervish. An extended hand drum solo section hit the rhythm, and the all-too-magnificent Corey Glover hit every note, leaving the crowd (and me) wanting more. I spent most of Conspirator’s set Friday night in a giant wooden chair that gave me a fantastic view of the Hill Holler crowd and stage. (I saw so many amazing hoopers and beautiful hoops!) A friend later took a tumble out of a similar chair nearby and got a pretty nasty welt on his shin, but after a trip to the medical tent in the morning he was set to enjoy the rest of the festival. Saturday night was surreal with an incredibly heartfelt performance by Michael Franti & Spearhead that had me in tears more than once. His message of love, understanding, and connection among peoples of all kinds really touched me and reminded me of what the festival community is meant to be. A meeting place for those with a vision of a better world free from hate and greed, but full of generosity and happiness for anyone who wants it. SOJA and Matisyahu also took the stage that night, only furthering the message. That atmosphere of love and generosity permeated the weekend, with an abundance of giddy adults and children. Bubbles floated on the air, a giant white swan maneuvered through the crowds, and so many people said “Hello. Glad you’re alive,” with either a smile or a gift. There’s nothing better than that feeling: the feeling of being caught up in the magic of it all, feeling that for at least one weekend you can be a part of that better world you long for. When I’m at FloydFest I feel at home. So many familiar faces, so many hugs to give and receive, so many long lost loves to catch up with. I’m constantly running into friends and friends of friends; it’s like being at home, only better. The sun rose on Sunday with me in a state of denial, not wanting to believe that it all had to end. I tried to convince myself I could stay, but soon the calls of work and responsibility would have to be answered, and so we packed up the tent and drove away as the sun set on the Blue Ridge Parkway. Thank you FloydFest, for reminding me just how special you are and just how beautiful a festival can be. I will never forget you again.